Check out that writing guys. I drew serifs. I think March is a perfect time to celebrate love and friendship and so the next couple of comics are going to be valentines to the little elephant. 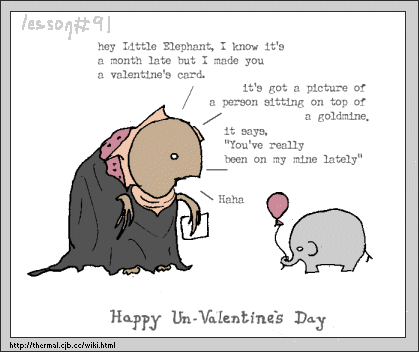 I'll include versions without the little elephants name on so you can give them to people you love and/or hate. Sounds like a good idea? Yes it does! Oh yeah, this comic is also a wallpaper in the downloads section.